Be Friends with your PC is a campaign that encourages people to think about the performance (speed and stability) of their PCs. Most people experience frustrations with their PCs every day – such as slow start-ups, freezing, crashing and clutter – and this initiative aims to educate users on how they can solve these issues and become friends with their PCs again. Slow, poor-performing PCs are making Brits increasingly frustrated. According to research released this week, the issue has become such a pain point that some Brits would much rather visit the dentist, queue for hours or be put on hold by a call centre for more than 10 minutes, than face a snail-paced computer. Whether it’s a slow start-up or the loss of precious files and documents, the annoyance caused by PCs letting us down has sky rocketed. Over a third of those surveyed find a slow PC just as aggravating as an airline losing their luggage and as infuriating as finding fraudulent charges on a credit card. For almost one in three Brits, the frustration is on par with losing a mobile phone. To help ease the pains of computer annoyances, a ‘Frustration Zone’ has been set up to release pent-up stress and help users be friends with their PCs again. 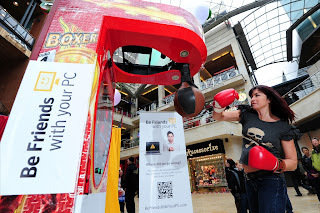 Fed up PC lovers can smash plates, hit out at punch bags and thump a boxer punch machine in a bid to tame tempers. The Frustration Zone has been set up by Be Friends with your PC, a campaign that encourages people to think about the performance (speed and stability) of their PCs.